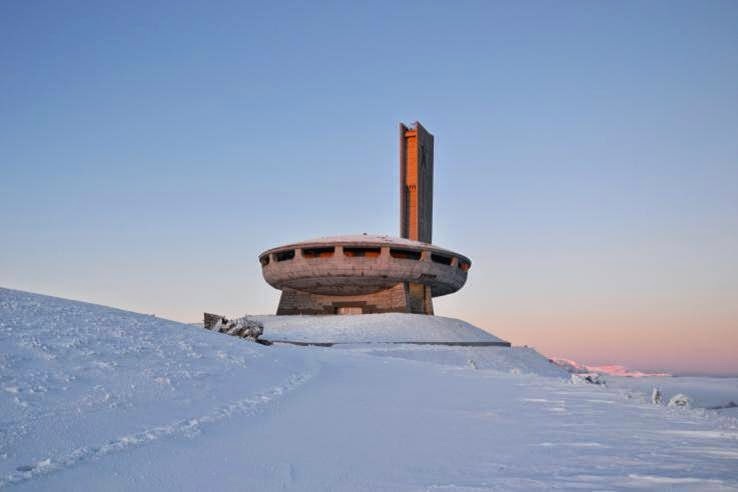 Buzludzha National Park in the beautiful Central Stara Planina, is situated right in the middle of Bulgaria at the heart of its rose growing area (one of the country’s main exports). 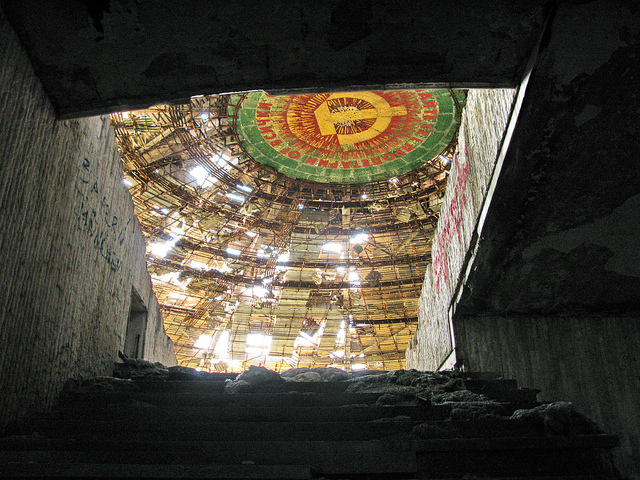 Yet when one arrives at the Shipka Pass there awaits something quite unexpected. 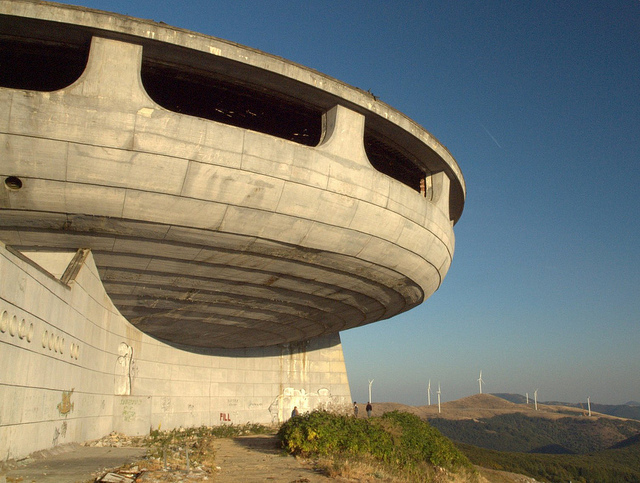 It is as if a huge flying saucer has chosen this spot in the Balkan Mountains for a leisurely pit stop and was then signposted, but abandoned by its owners. 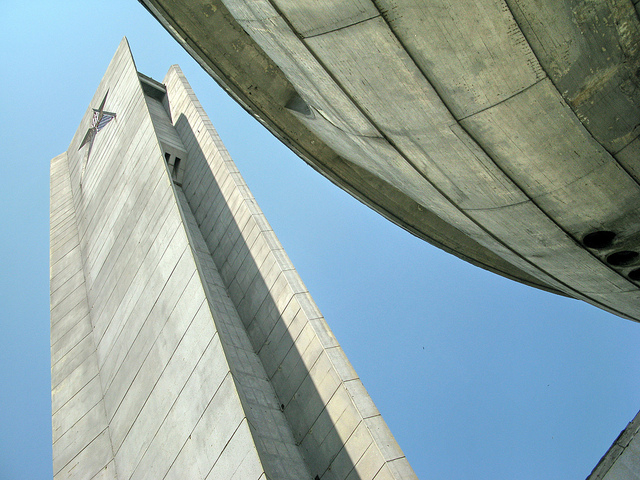 Yet this colossal concrete edifice (spelled variously Buzludja and Buzludža) has a history much more down to earth than that. 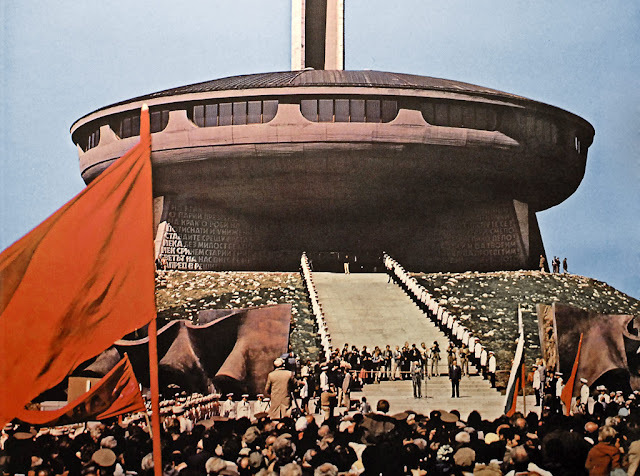 It is what remains of an extravagantly expensive project by the leaders of the country’s old communist regime to tie up their own system of government with the mythos of the country’s 1300 year old foundation as an independent state. 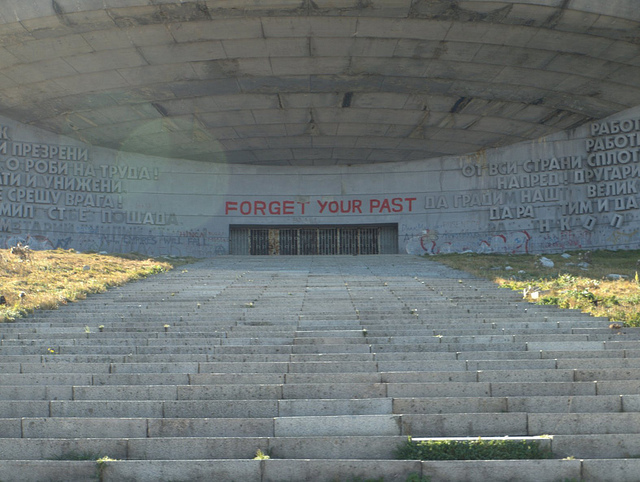 Forget your past? Hardly something the firecely proud people of this country might do - or so you might think. A look inside reveals something extraordinary. However, it is a far cry from the way it looked when it opened. 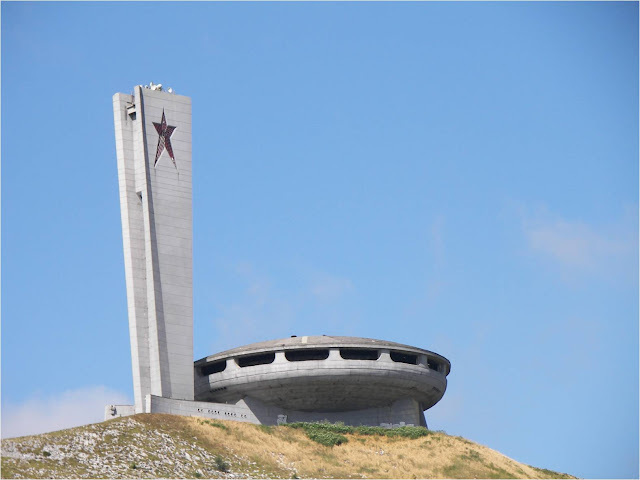 The site is pivotal in more recent Bulgarian history and the monument was built to celebrate more recent acts of daring do. 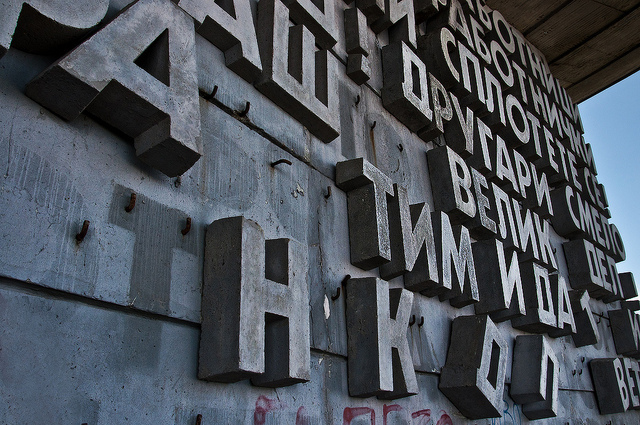 The remote site is where the foundations of the socialist movement in Bulgaria were established in 1891. Additionally it is where the Bulgarian and Russian armies repelled the Ottomans in 1877-78. 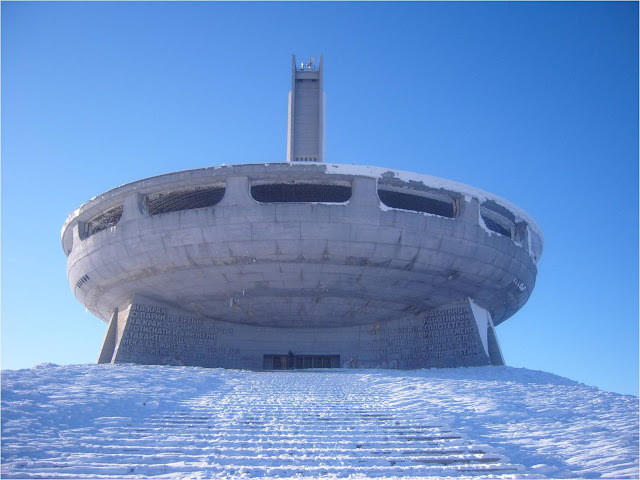 If anything could be described as the Saratoga of Bulgaria, where a real and measurable turning point occurred, then it is Buzludzha. 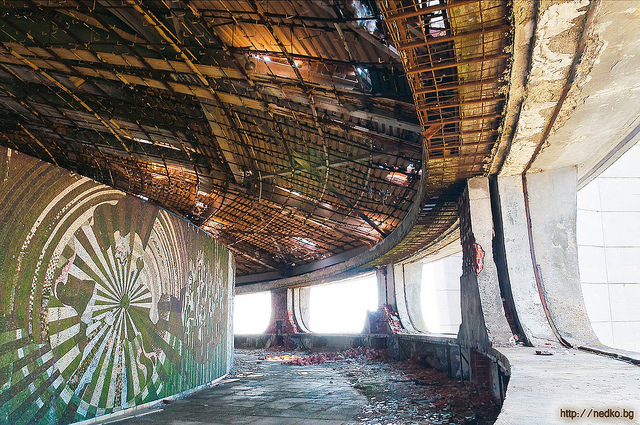 Opened in 1981 on the 1300th anniversary of the founding of the state of Bulgaria the building was abruptly abandoned less than twenty years later after the fall of communism in Eastern Europe. 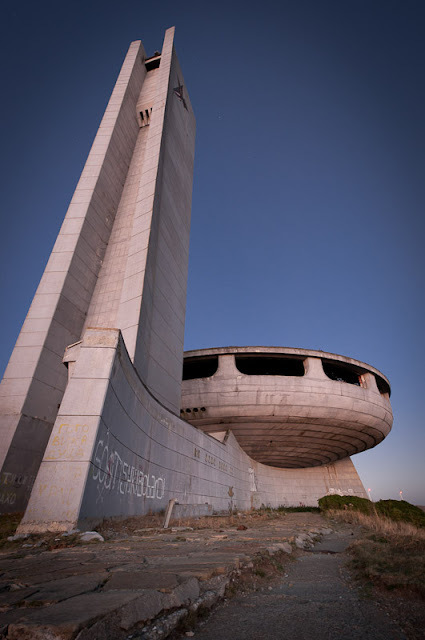 Yet despite the revilement that many must have felt towards the old regime together with the rush to democratize institutions and join the European Union, it is puzzling to many why such an important monument was left to wrack and ruin. 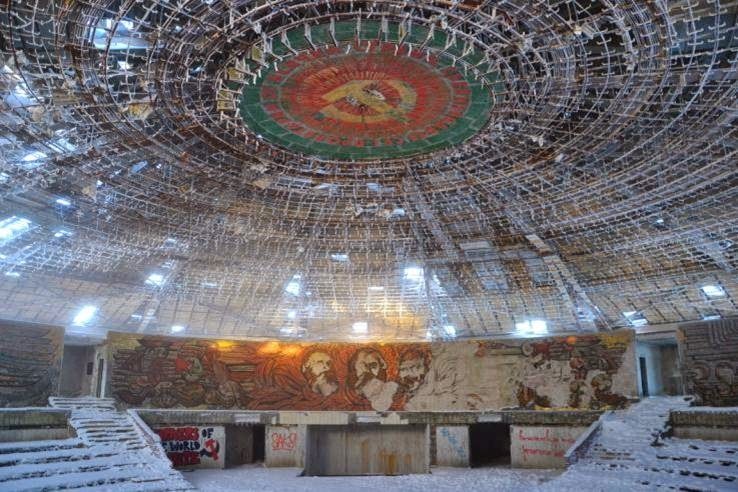 Perhaps it was seen as too recent a reminder of the decline of the Bulgarian communist state from an idealized worker’s paradise to the autocratic gerontocracy it became. 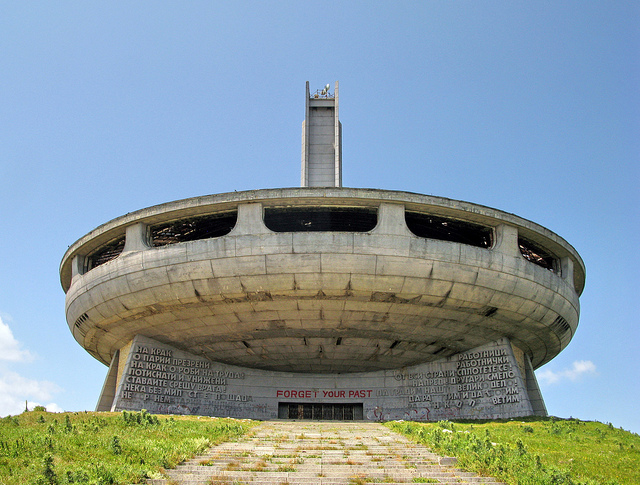 Perhaps it was simply an issue of finances – Bulgaria had many more pressing economic concerns during its transition to democracy than an (albeit historically significant) enormous lump of concrete on a windswept hillside. 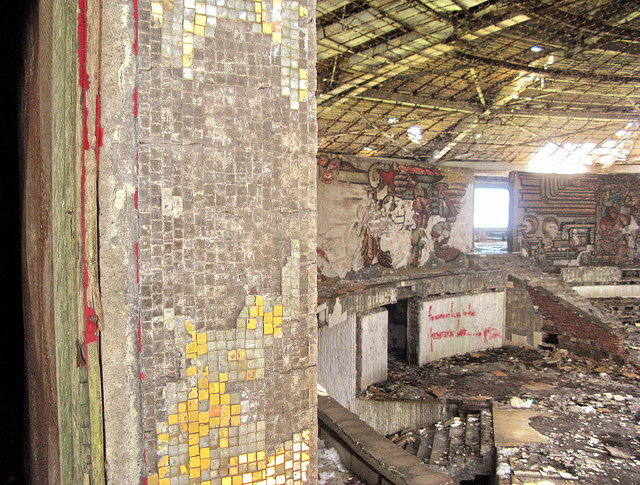 When compared to pictures of the monument when it was first built the state of dilapidation can be seen. 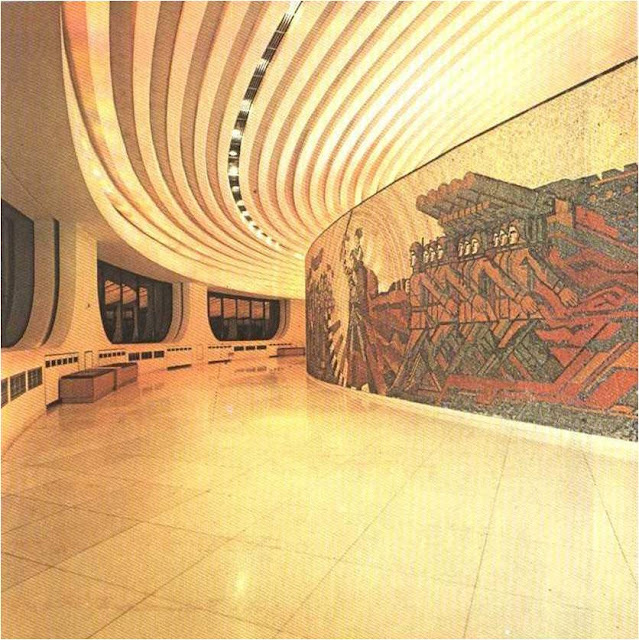 After all, this is only a building which is thirty years old. The grassland surrounding the monument was, until very recently, a pasture for both horses and cows. Perhaps Orwell would have found some humor in the fact that the steps leading up to the monument were for decades covered in the excrement of animals who were not among those considered more equal than others in his famous allegory. 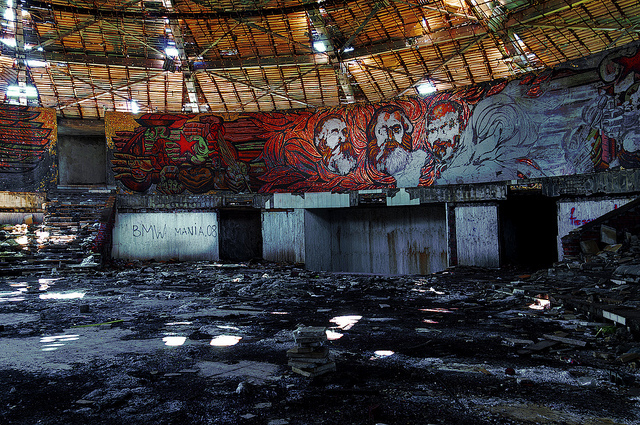 If this is Bulgaria’s Manor Farm then the remaining animals certainly made their feelings quite plain. Yet it must have been quite spectacular when it first opened. 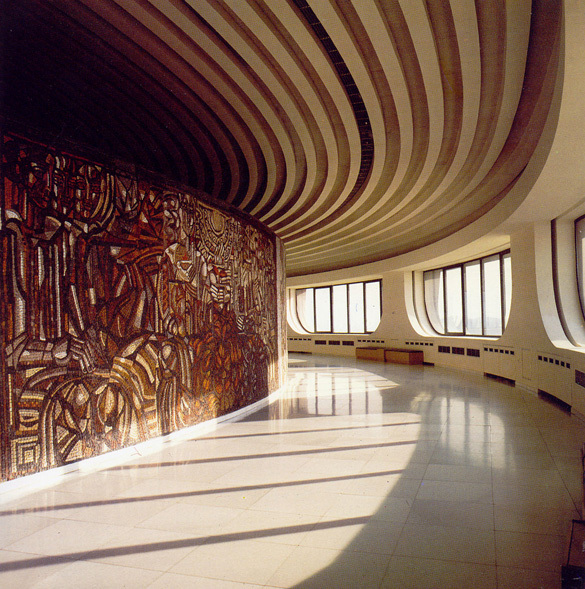 The careful (and trespassing) visitor can find a number of entrances to use in order to explore its interior. 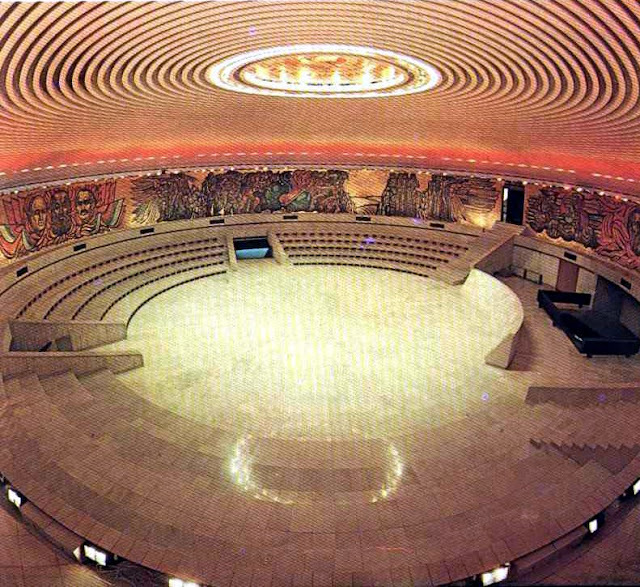 There they find a once magnificent debating chamber. 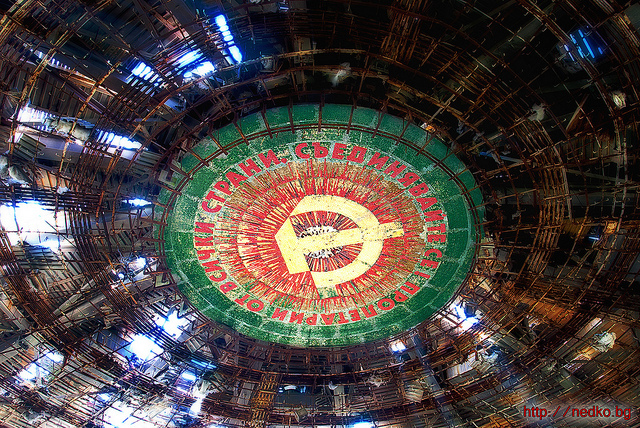 On the centerpiece of the ceiling you can still make out the hammer and sickle and words engraved around it which translate: Proletariat of every country, unite! 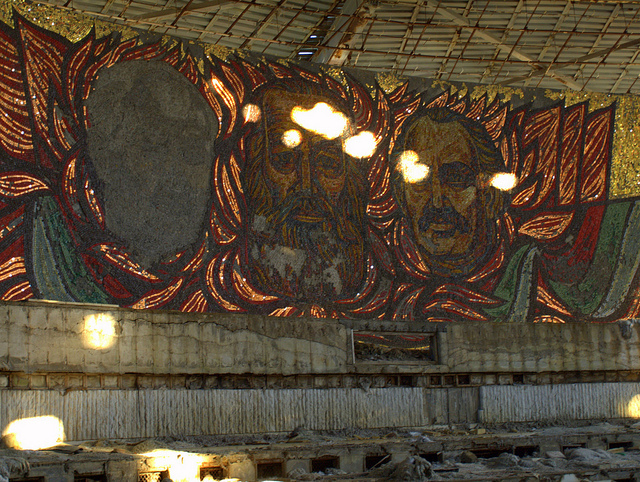 Once beautiful gilded mosaics are everywhere, depicting Bulgarian and Soviet communist leaders like Dimitar Blagoev, Georgi Dimitrov, Todor Zhivkov, Vladimir Lenin, Joseph Stalin, Vladimir Lenin and Leonid Brezhnev. It is said that buried in the cold earth beneath the monument is a capsule, placed there not without some hubris it must be said, which bears a message for the future. 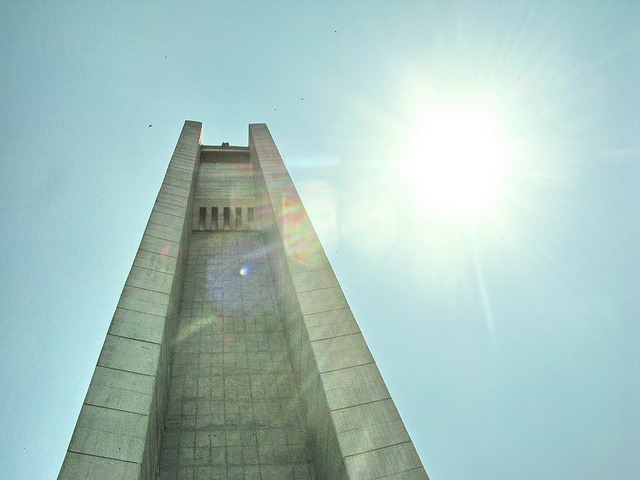 And the monument may well have a future. 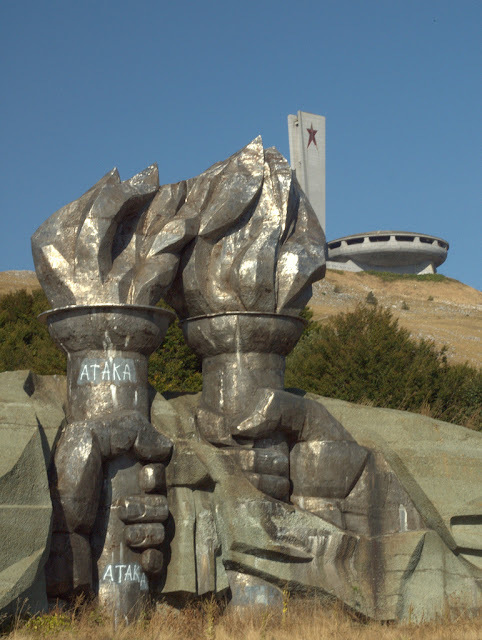 In September 2011 the Bulgarian Cabinet transferred the monument and the surrounding land to the Bulgarian Socialist Party, waiving any fee and gifting the entire responsibility for its management to the left-wing political party. 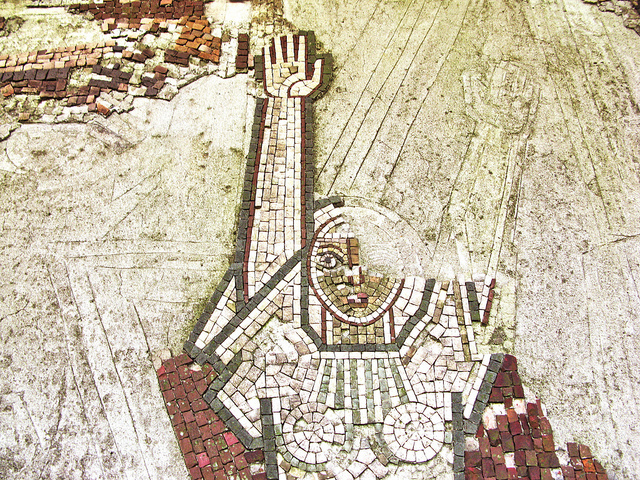 Its members hope to restore the monument to its former glory and then allow visitors to see how it looked in its 1981 heyday. They have their work cut out for them. 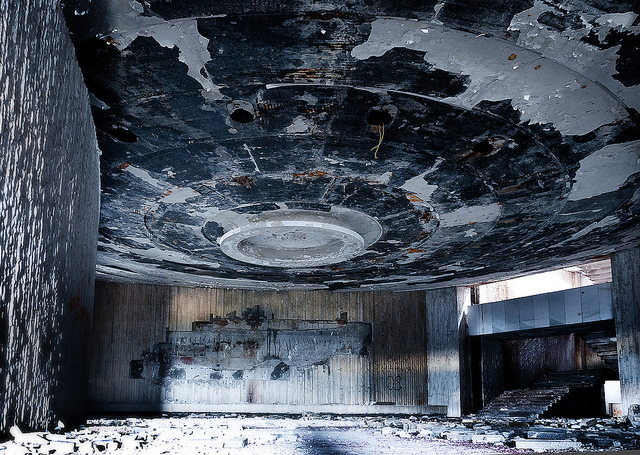 A recent fire inside the huge auditorium has done even more damage to the site. 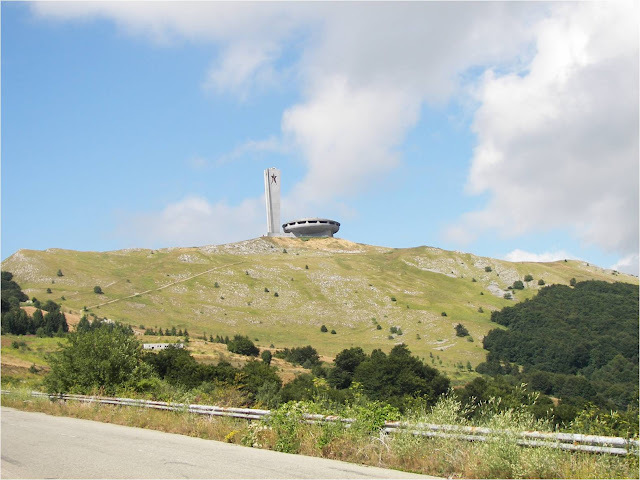 The politics of those wishing to preserve the Buzludzha Monument is something of an irrelevance. 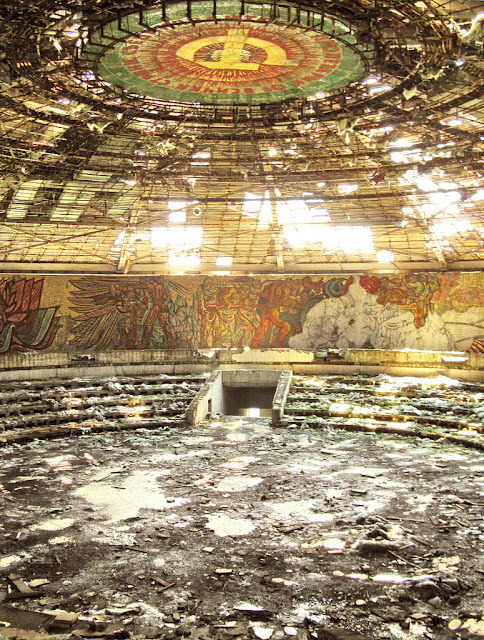 The fact that such an important building has been left to decline in to such a deplorable state should be something of a national shame for all Bulgarians. 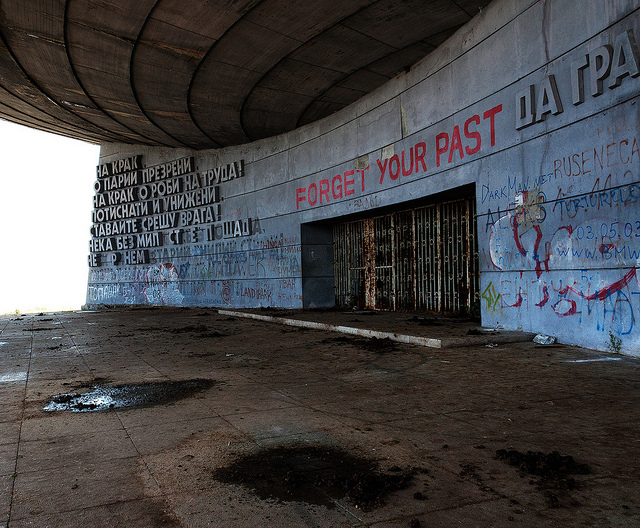 Although the graffiti above the entrance encourages us to forget your past, history has shown countless times that those who chose to ignore the mistakes of the past may well be doomed to repeat them. Kuriositas would like to particularly thank the following Flickr photographers who kindly allowed us to use their photographs for this piece. Adam Lewis (Flickr Photostream, blog and his website design and development company, Best Served Cold), Nedko Ivanov and ERA SURA. Please visit their very interesting Photostreams and sites by clicking the links! Finally, here are two amazing photographs taken recently by Valentin Rüst of Don't Complain Travel. 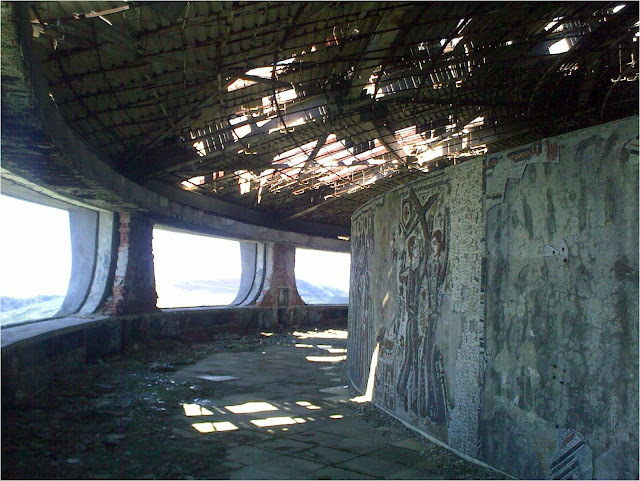 Click on either of the pictures to go to Valentin's in depth report on how the Buzludzha Monument looks today.